To some avid cigar smokers, cigar humidors can multiply like rabbits. When I first started smoking cigars I had one lonely box on a desk, and before I knew it, I had acquired more humidors than I had places to put them. But that’s a natural evolution for a cigar-lover, especially one who follows ratings and recommendations of online cigar reviews (and is always buying new cigars faster than can be consumed). 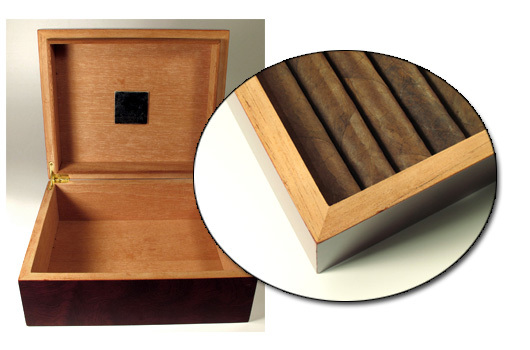 When we first get started with the cigar obsession, many of us buy the least expensive humidor we can find. After all, we start with only a handful of cigars, often recommended by a cigar store clerk who also directs us to a humidor in which to keep them. He tells us about conditioning the box and instructs us to put that 50/50 solution in the black rectangular sponge thing. But what he doesn’t tell us is that the humidor is barely suited to protect and condition our cigars. The problems are not obvious because even inferior humidors can look beautiful. That’s how the manufactures get us to buy them. Conversely, expensive humidors can have the same deficiencies as that of the cheaper ones. So what makes a humidor effective? 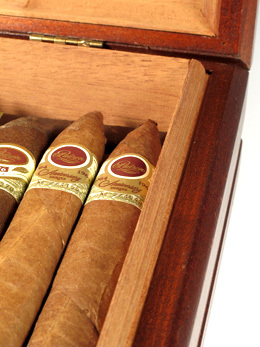 There are two major differences between an inferior humidor and a “real” humidor. (Real being one designed to adequately protect your cigars). One is wall thickness and the other being a lining of Spanish cedar planks rather than a thin veneer. It stands to reason that the thicker the wall, the more moisture retention the humidor will have, and this is certainly true. But the addition of cedar planks will not only add more wall thickness to the humidor, it will also keep the cigars further from the materials used to construct the box. 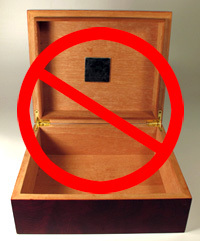 Today’s humidors are often made from particleboard and not from solid wood. 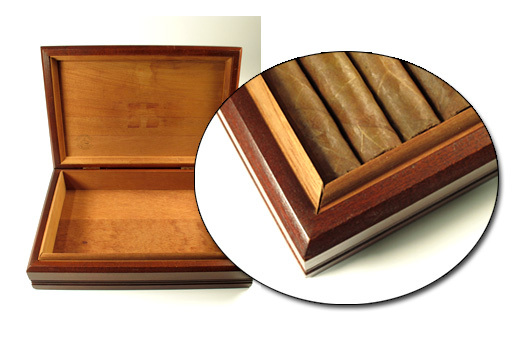 (The highest quality humidors are made from solid wood but can be prohibitively expensive). Particleboard is made from wood scraps left over from sawmills, combined with a binding agent and pressed into thick sheets. Although the resins used to make particleboard are considered environmentally safe, it does contain formaldehyde. [i] (I’d rather my cigars not spend years in a formaldehyde environment, but that’s just me. So the barrier of additional cedar seems desirable.) But most importantly, particleboard is not resistant to moisture. This translates to poor moisture containment within the humidor. The addition of a layer of solid Spanish cedar adds insulation and helps to maintain the humidors desired internal humidity. And there is another weak link in many humidors, even some with cedar plank lining. That is the very thin wood used at the bottom of the boxes. I have eleven humidors and many of them have this hidden flaw. If you are a little handy and have a miter box, you can turn an inexpensive humidor into a “real” humidor. 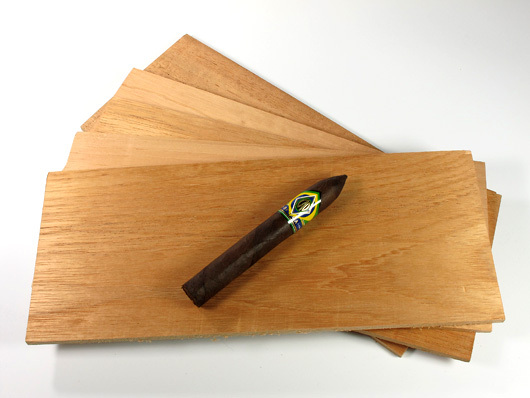 By performing an Ebay search for “Spanish cedar” you can usually find people selling exactly what you need…inexpensive ¼ inch planks of kiln dried Spanish cedar. By measuring and cutting you can create a true cedar lining and a thicker, more protective humidor bottom. And the improvement is well worth the effort. The additional insulation will help the humidor retain moisture and the internal humidity will be more reliable. As a result, your cigars will be better conditioned, which in turn will age them properly. When buying new humidors it is good to look for boxes that have these features, and price is not necessarily an indicator of quality. Some cheap humidors have them while some expensive ones don’t. It has been my experience that when researched, it is possible to get a very good humidor at a very reasonable price and, invariably, the boxes with the thick, cedar lining will give the best performance. Sometimes they require additional wood on the bottom but if the humidor is kept in a stable environment, and on a solid piece of furniture, the bottom modification is not that crucial. Of all the humidors I’ve gotten over the years, I have two favorites. The first being my beat-up, used from Ebay, Diamond Crown humidors. They have thick cedar lining on the sides and bottom, and retain moister beautifully (but they tend to be small). The other recommendation is the Treasure Dome humidor. It’s got great features, is very effective, and can store a large number of cigars…it’s huge for a desktop humidor. A staple of cigarbid.com (search for Treasure Dome), it has a “Quick Buy” price of $100 and if the timing is right, you can get it for even less. Hope this was helpful. Happy smoking. [i] Online article about particleboard. I purchased many desk top humidors until I found the Lauderdale end table cigar humidor it has solid wood construction and a good 1/4 spanish cedar lining. All at a cost that is very reasonable. It holds up to 500 cigars and has two moveable shelves as well as an electical outlet for plugging in my humidifier. I also use spanish cedar trays to seperate out my collection. I would highly recommend this humidor. I 100% agree with your way of thinking. Everything makes sense finally, thanks a lot. I started making high end solid wood humidors know any sites where the expensive ones are? I bought a humidor from LanceAllenHumidors. You can have them build you a custom one online, but I got mine from Monte’s Cigars in Albuquerque, NM. Its real similar to what you’re taking about in the article. Solid walnut about 3/4″ thick, with 1/4″ spanish cedar interior. This humidor can hold at 70% for about a month before I have to refill my sponge.! I thought the price was really good too, $229.00 for a 80 count. I came up with a solution that seems to be working. I purchased a small air conditioned humidor that holds 250 cigars and has a drawer and 2 shelves, all Spanish cedar. I conditioned that….and then put my 2 cheap humidor boxes and one nice thick larger humidor box inside of the air conditioned humidor. All fit nicely. (2) I can indulge my obsessive behavior of constantly opening the larger AC unit to look into the glass tops down at the cigars and hygrometer inside. Sure it may temporarily reduce the AC humidity level from 70% down to say 62% each time, but it’s mitigated by keeping the other boxes closed. All humidity loss is compartmentalized.